It still doesn’t seem like it was all that long ago, but at this point it was 18 months ago when NVIDIA launched the first member of their Maxwell 1 GPU family, the GM107-based GeForce GTX 750 series. A prelude of things to come, the GTX 750 series introduced us to NVIDIA’s highly optimized Maxwell architecture, reaching new levels of energy efficiency and also work efficiency per CUDA core. What the Maxwell 1 architecture lacked that Maxwell 2 brought with us later in 2014 was support for newer features such as HDMI 2.0 and graphical features like conservative rasterization – Maxwell 1 from a feature perspective was closer to a highly power optimized Kepler in that regard. Maxwell 1 of course was relatively short-lived before NVIDIA moved on to Maxwell 2, delivering GM204, GM206, and GM200 over the last 12 months. Given NVIDIA’s unusual rollout of Maxwell 1 and Maxwell 2, there has always been some question of if and how NVIDIA would follow up on GM107; it’s a power efficient architecture, but there’s a real feature disparity. As has become clear since then, NVIDIA is not going to rev another lower-end GPU so soon after the last one. Instead, with GM206 currently powering only a single product – GTX 960 – NVIDIA is instead going to cut down GM206 to close the gap in as reasonable a manner as the situation allows. The end result of that is that today NVIDIA is launching the GeForce GTX 950, the Maxwell 2 update for much of the rest of NVIDIA’s lineup. As yet another GM206 SKU there are no big surprises here – we’re already familiar with GM206 – but this brings GM206’s performance and features down to a lower price point of $159. Meanwhile on a quick housekeeping note, as today's launch comes at the tail end of Intel's IDF 2015, timing constraints mean that we won't be posting our review of the GTX 950 today. Our full review will be up next week once the show has concluded, so be sure to check back a bit later this month. Diving into the specifications, NVIDIA has cut down GM206 in such a manner that I suspect it’s not quite as steep a cut from GTX 960 as some readers would have expected. Compared to GTX 960, GTX 950 loses one-quarter of its SMMs – going from 8 to 6 – bringing the CUDA core count down from 1024 to 768. Otherwise the memory bus/ROP clusters are left intact, with 32 ROPs connected to a 128-bit GDDR5 memory bus. As for clockspeeds, relative to GTX 960 what we’re seeing both is and isn’t much of a cut. GTX 950 ships with a much wider delta between the base clock and boost clock than GTX 960, with a 1024MHz base and 1188MHz boost. This larger disparity is for power reasons, as a lower base clock goes hand-in-hand with tighter TDP restrictions (more on this in a sec). What this means is that GTX 950 can boost almost as high as GTX 960, but when facing a more strenuous workload it will have to back off in a manner GTX 960 did not. Meanwhile memory clockspeeds have also taken a haircut from 7GHz to 6.6GHz. This mostly seems to be for the purpose of creating an artificial distinction, as no one supplies a 6.6GHz GDDR5 speed grade as far as we’re aware. In any case this puts the theoretical performance of the GTX 950 at anywhere between 101% and 68% of the performance of GTX 960, depending on the workload. In practice we’ll find that it’s closer to the smaller of those numbers, as most workloads are clearly shader/SMM-bound right now, feeling the pinch of fewer CUDA cores. On the other hand in the unlikely scenario of having a workload that was ROP-bound, then GTX 950 could get near-GTX 960 speeds. The final major shift for the GTX 950 is TDP. GTX 960 was a 120W TDP part, but for GTX 950 NVIDIA is dropping the TDP to 90W. This is accomplished through the aforementioned disabled SMMs, along with greater GPU throttling (relative to boost speeds), in order to keep the card at that point. 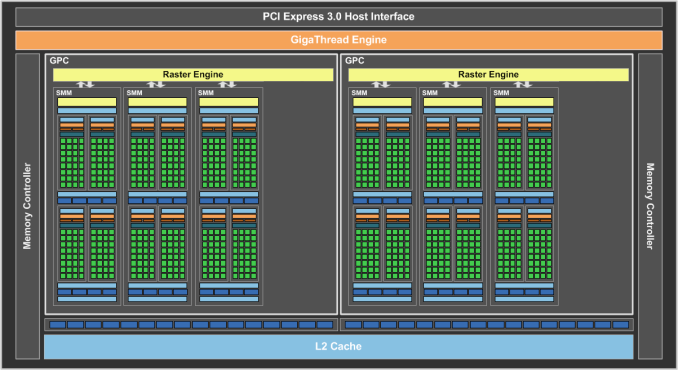 As a result GTX 950 still requires a 6-pin PCIe power connector, and the TDP drop is more about improving the card’s suitability in HTPCs or other lower-power PCs. 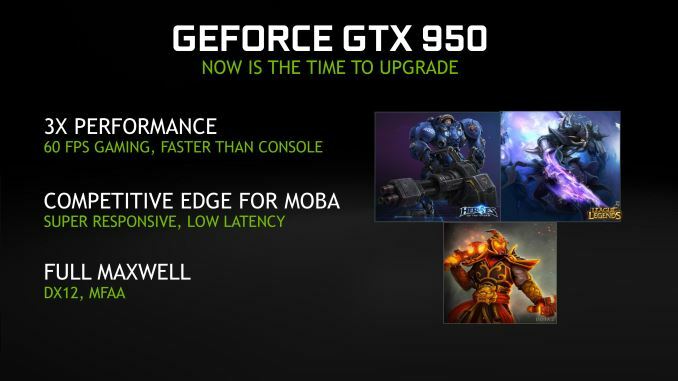 The end result is that NVIDIA is pitching the GTX 950 about as you’d expect it. For HTPC users who wanted what’s still the only GPU with both HDMI 2.0 support and HEVC decoding, GTX 950 is a cheaper, lower power option. Otherwise for budget gamers, like the rest of the GTX 900 series, NVIDIA is pitching the GTX 950 as the next-generation replacement for GTX 650. 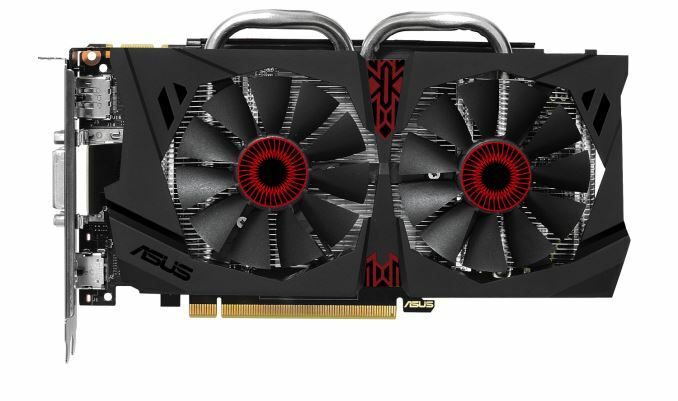 We’ll save the marketing for another time, but expect to see NVIDIA push the GTX 950 as the ultimate MOBA card, offering a decently inexpensive option for League of Legends/DOTA 2 users who are after both high framerates and high image quality. As an aside, in some of the pre-release leaks I’ve seen the GTX 950 referred to by commenters as the “GTX 900 China edition” – in reference to the Chinese market’s price points and love of MOBAs – and this is probably an accurate description. MOBAs have been a big success story for PC gaming, especially over in Asia where their free-to-play nature makes them more accessible to gamers who have less disposable income, a problem that similarly makes more powerful video cards less affordable. PC video card sales volume is already inversely proportional to price and I’m sure that GTX 950 will sell well for NVIDIA worldwide as a result, but I wouldn’t be the least bit surprised if Asian (APAC) GTX 950 sales significantly outpaced North America and Europe. Meanwhile, as the more immediate successor to the GTX 750 series, the GTX 950 represents more of a half-step up, similar to what we saw with the GTX 700 series versus the GTX 600 series. GTX 950 packs more CUDA cores than any GTX 750 series SKU, and as a result will have no problem outperforming it. But since both families are based on versions of the Maxwell architecture, it won’t be a huge jump. 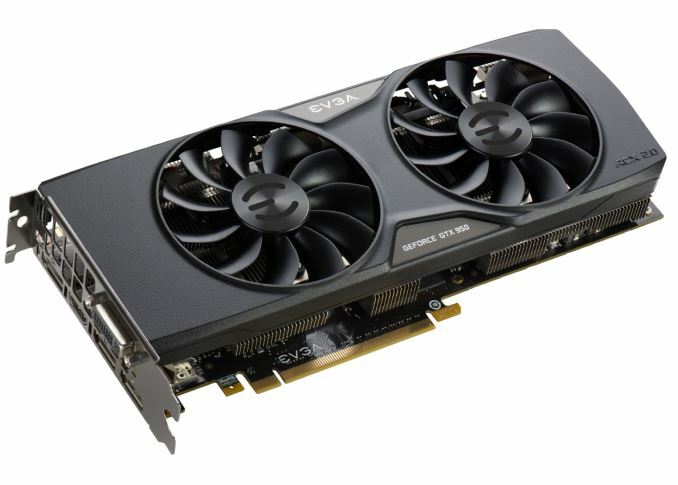 And low-power users will want to note that the GTX 750 series remains NVIDIA’s only sub-75W (no PCIe power connector) cards. In fact by NVIDIA’s TDP numbers GTX 950 is a bit power hungry, packing in another 128 CUDA cores, faster memory, and Maxwell 2 features in return for a 30W (50%) increase in TDP. Finally, let’s talk about pricing and the competition. The GTX 950 will be launching at $159 – NVIDIA seemingly going $10 over the more typical price point because they can – $40 below the GTX 960 and $40 above the GTX 750 Ti, which remains on the market and retails for around $119. The GTX 950’s direct competition from AMD will be the Radeon R7 370, AMD’s latest cut-down Pitcairn GPU, which launched back in June at $149. At this point AMD can’t compete in this segment of features – simply put, Pitcairn is old – but what AMD can offer is better performance for the money, so R7 370 is still stiff competition for the GTX 950 for some market segments. Since GTX 950 is based on GM206, today’s launch is a hard launch, and we don’t expect cards to be hard to come by. Partners are launching fully-custom cards right out of the gate, including factory overclocked cards. So expect retail prices between $159 for those cards closest to the reference specifications, up to $179 for the biggest factory overclocks. "Meanwhile on a quick housekeeping note, as today's launch comes at the tail end of Intel's IDF 2015, timing constraints mean that we won't be posting our review of the GTX 950 today. Our full review will be up next week once the show has concluded, so be sure to check back a bit later this month." Later this month is lazier.